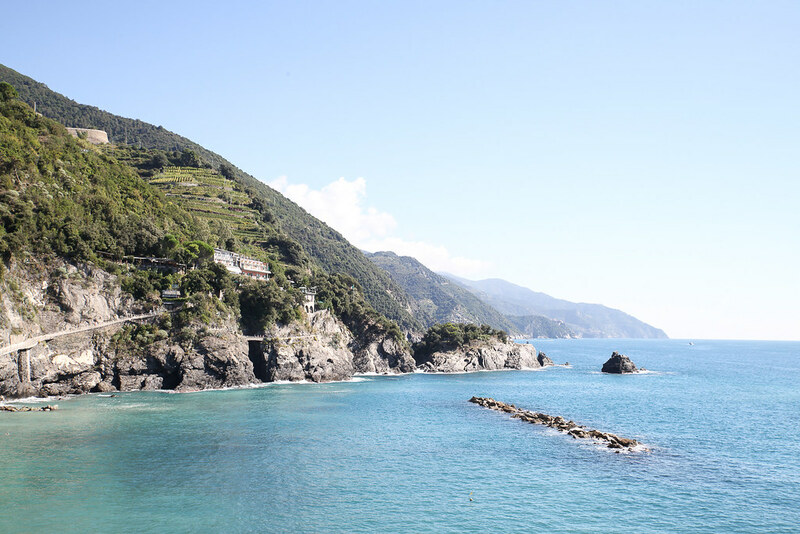 My initial feelings towards Cinque Terre were that it did not live up to my expectations. 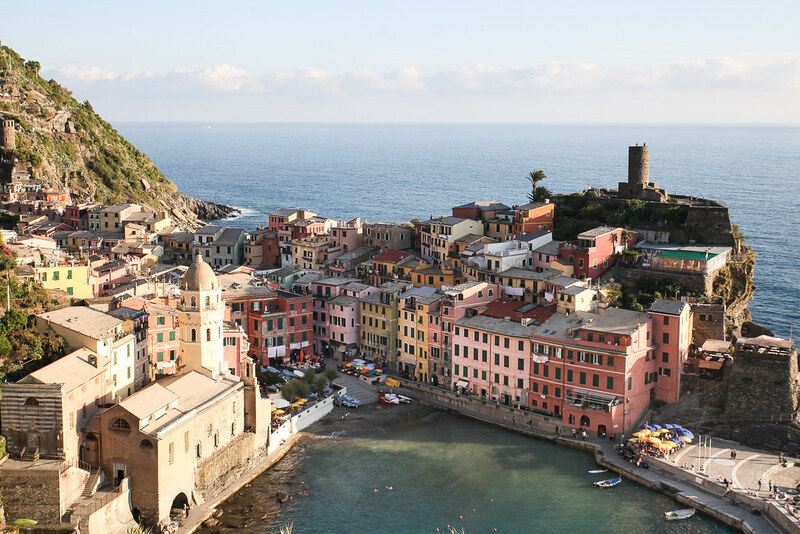 We arrived straight from pristine Portofino to the rugged looking town of Vernazza which felt overwhelmed with tourists flocking in from the train station and I couldn’t help but compare the two places. On our final evening, I climbed the beginning of the hiking path and caught the most beautiful sunset I have ever seen. The whole town of Vernazza was bathed in a purple hue, as the sun slowly sunk into the horizon opposite, lighting up the sky with intense shades of pink and orange. It was in that moment that I understood the beauty of Cinque Terre, and realized that beauty comes not in comparing somewhere to a previous destination, but in appreciating each place in its own right. I watched the sea lap against the rocks beneath, listened to the gentle engine of the boats pulling into the harbour and watched the lights of the town come on one by one. It felt as though I had the whole town to myself and I let myself get completely and utterly lost in the moment, reminding me once again why I love travelling so much. 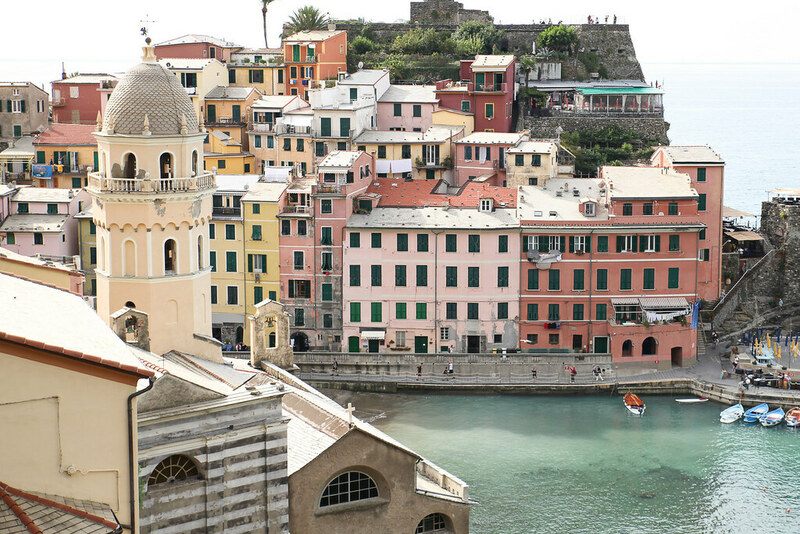 We stayed in Vernazza and I am so glad we did as it is my by far my favourite town. 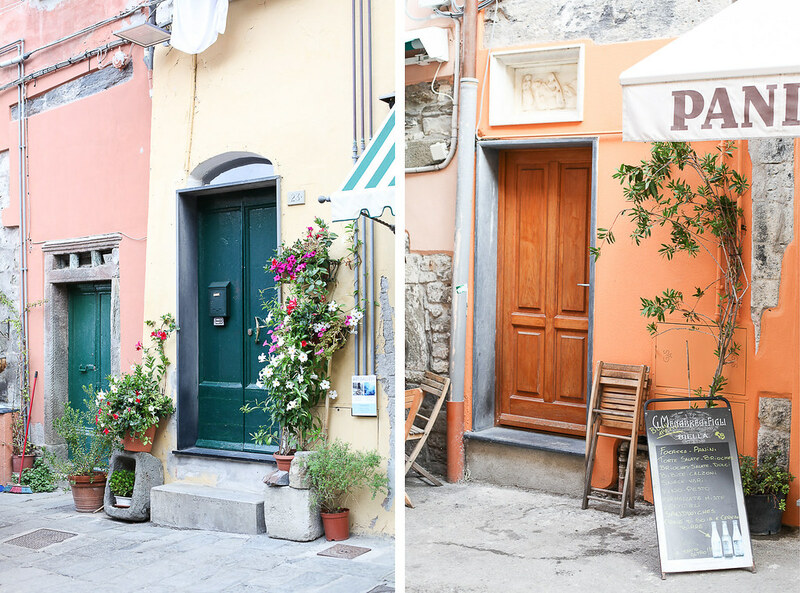 It’s relatively small but has oodles of rustic charm with a few boats in the marina, lots of authentic Italian eateries and plenty of cobbled back streets to get lost in. 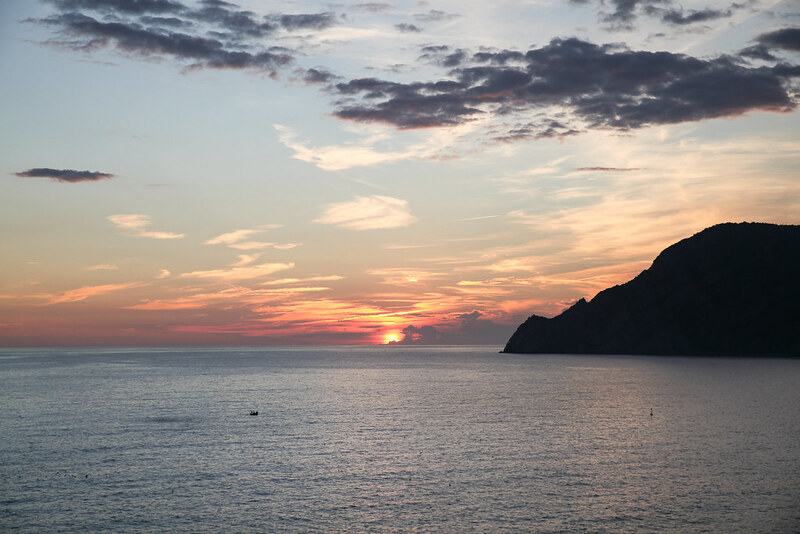 The hiking trail from Vernazza to Monterosso is very scenic and offers beautiful views over the town of Vernazza particularly at sunrise and sunset. 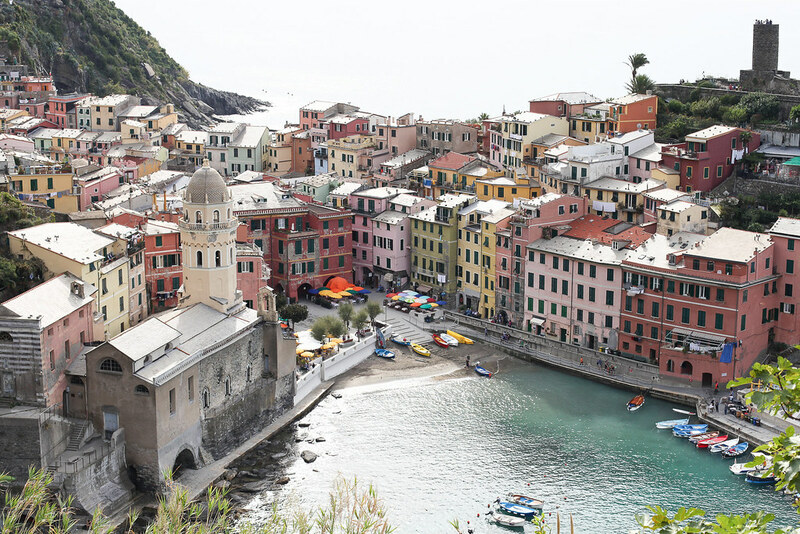 Riomaggiore is the first of the villages that make up the five towns of Cinque Terre. The best photo opportunity is to be had at the foot of the valley, with a perfect view of the harbour in the foreground and multi-coloured houses built into the rocks in the background. 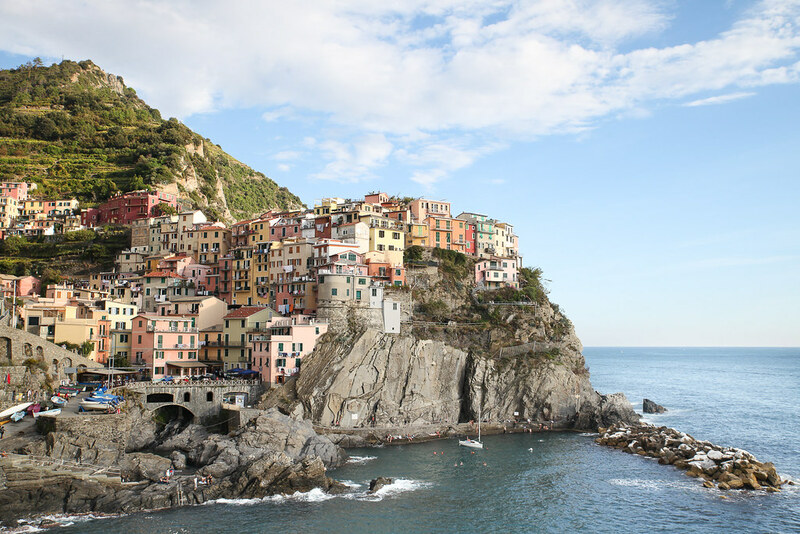 Manarola is probably the most picturesque of the towns. It’s where the famous hiking trail Via dell’Amore commences which is the most walked of all the trails due to its ease and scenic views. Corniglia is the only village that isn’t directly on the coast; it’s set amongst rolling hills and vineyards making it the most verdant one. 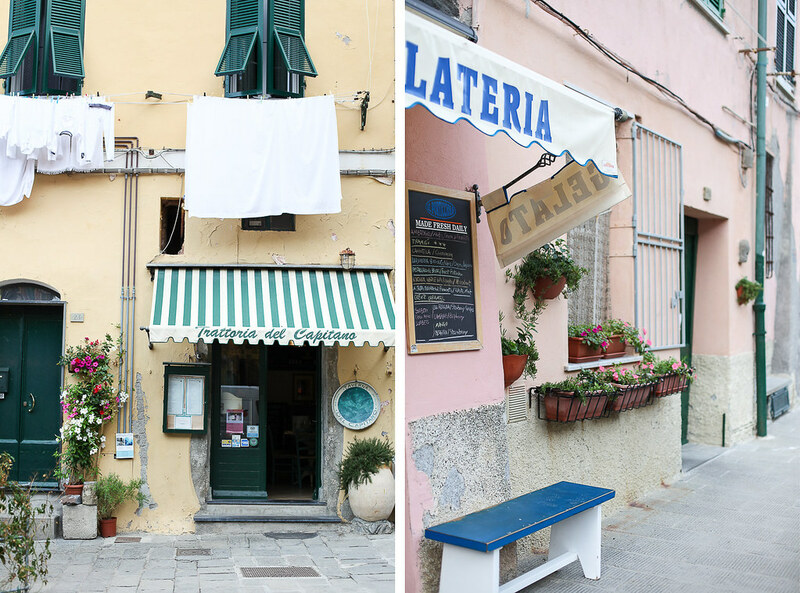 Visitors flock to Monterosso for the long, sandy beach as it’s the only one close-by. For me Monterosso was the least authentic of all the villages but it does have the attraction of swimming in the glistening sea. 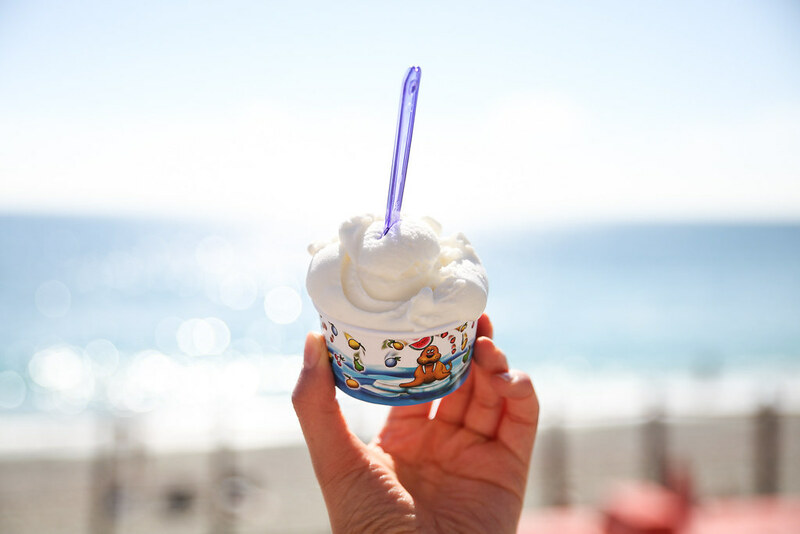 The most authentic gelato in Cinque Terre. For authentic Ligurian cooking I would highly recommend this restaurant. You’ll find lots of seafood on the menu, a few favourite dishes are the whole sea bass baked in rock salt and the black squid linguine with pesto and pine nuts. The owner of this bar could not be any more Italian or any more relaxed. The bar has seating for only six people on the terrace yet despite the small amount of customers to look after the bartender takes an excruciatingly long time to serve them. If you’re not in a hurry and are happy to wait for him to finish his cigarette then this is the most authentic bar serving excellent Italian wines right on the marina. And after all the slow approach to life is the Italian way. The typical dish originating from Cinque Terre is trofie pasta with pesto and the Belforte restaurant boasts the best recipe in the area. The homemade pasta comes generously smothered in freshly made, creamy, garlicky and basil pesto and truthfully it is the best I’ve ever eaten. The location of the restaurant is idyllic overlooking the sea with the waves crashing against the rocks beneath. For a more relaxed evening with a convivial atmosphere, grab a pizza and a couple of beers and watch the sunset on the rocks. Lunch Box is a great little spot for a health kick if the carb-heavy diet gets a little too much. 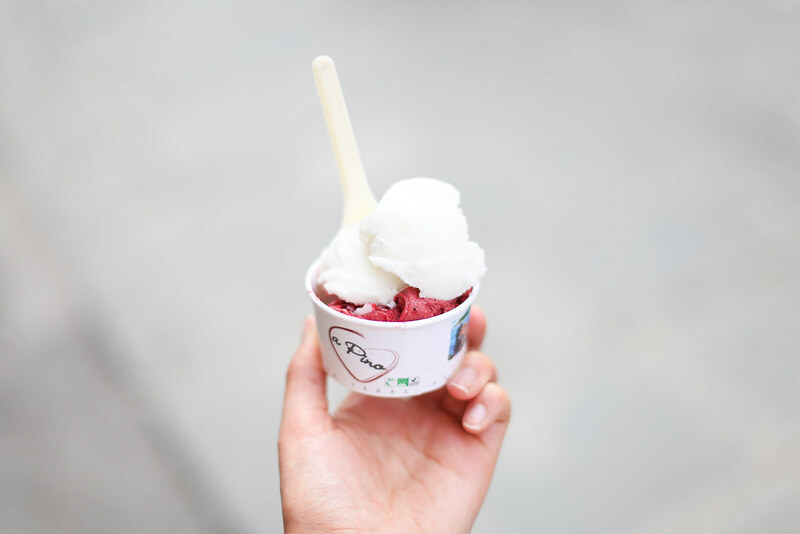 You can get your hands on tailor made juices with every fruit imaginable and punnets of fresh berries. The views from this restaurant cannot be beaten. 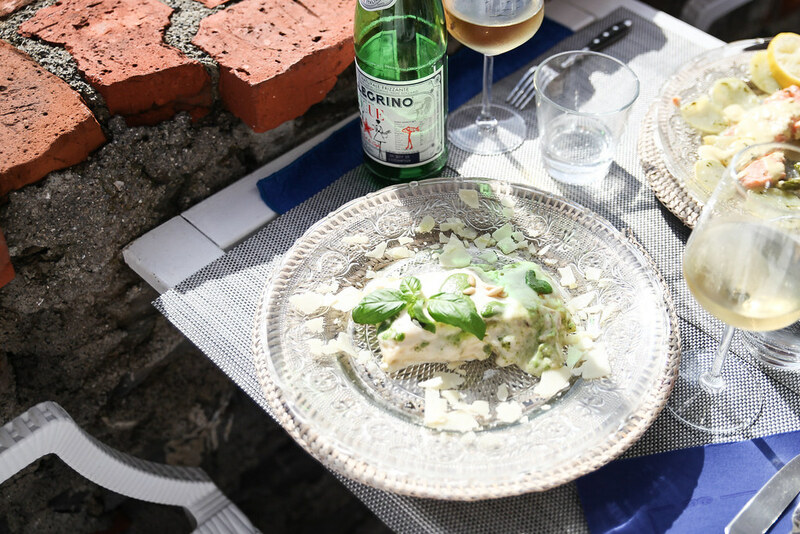 The food is homemade and hearty offering classics such as bruschetta and focaccia sandwiches but the best part is the pretty view overlooking Manarola. 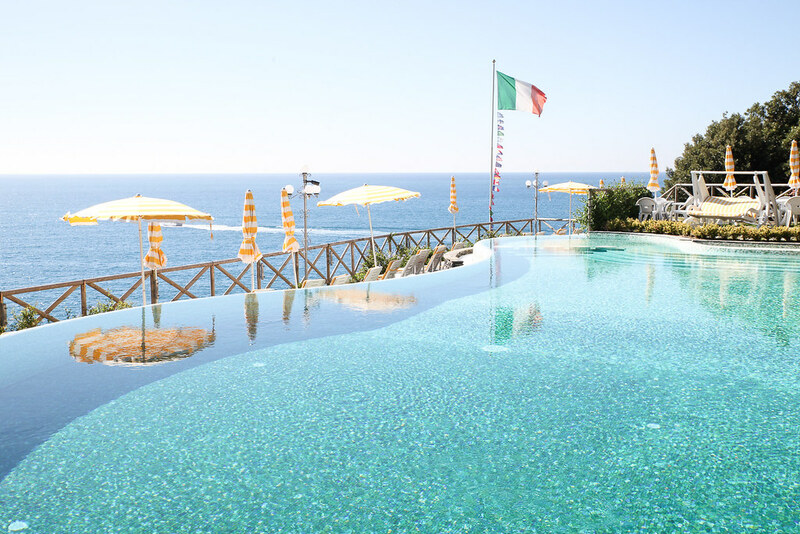 This hotel is located on the sheer cliffs of Monterosso and spoils guests with endless beautiful views. The swimming pool is among the most beautiful I’ve seen mirroring an infinity pool where clear turquoise waters seemingly merge into the blue sea. The setting of this restaurant is very romantic as it teeters on the cliff face and overlooks the sea. The menu offers Italian classics such as pesto lasagna and a wide selection of fish dishes. 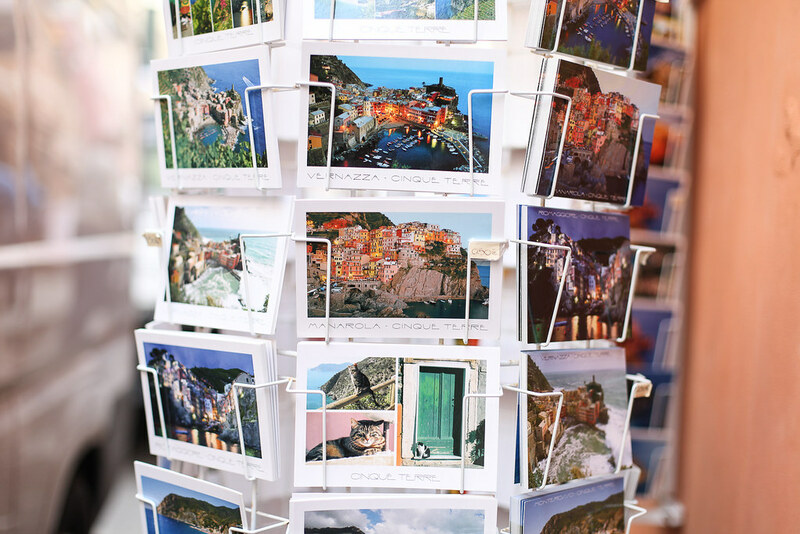 Oh what I would do to be in Cinque Terre right now! Wonderful photos! It’s been on my list to go to Cinqueterre for a long time now but I know what you mean about a place being completely swarmed with tourists, I had the same experience in Florence recently – it was more underwhelming to visit when you can’t see a corner of the city without a tourist in sight… Nevertheless it was beautiful! !